Originally from San Diego, J.M. Woody van Horn’s career was ignited as he worked at some of the top locations in town such as Arterra, Market Restaurant + Bar, Bertrand at Mister A’s, and The Grand Del Mar Resort and Spa, which was California’s only Forbes Perfect 15-Star resort. From there, he continued to feed his passion for the culinary and beverage arts, first at Hyde Park, New York, where he earned a degree at the Culinary Institute of America and worked both in the kitchen, and on the farm of Blue Hill at Stone Barns, which was awarded a James Beard Award for Outstanding Restaurant in the US. After that, he returned to California and took part in the Accelerated Wine and Beverage program at the Culinary Institute of America at Greystone in Saint Helena. 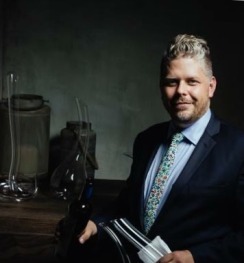 After his formal training, Woody spent more time in the wine country as the Assistant General Manager and Wine Director at Michelin-recommended Goose & Gander in Santa Helena, and as Dining Room Manager at Michelin Star-rated Bouchon Bistro, a member of Thomas Keller Restaurant Group in Yountville. Eventually, Woody’s heart led him back to San Diego initially as General Manager at Bankers Hill Bar & Restaurant. Then as Opening General Manager of James Beard Nominated, Bracero Cocina in Little Italy, San Diego's Restaurant of the Year. He is currently finishing up his master’s certificate in Revenue and Finance Management at the Cornell School of Hotel Administration.